New improved version of the highly regarded Lodestar USB2.0 guide camera. 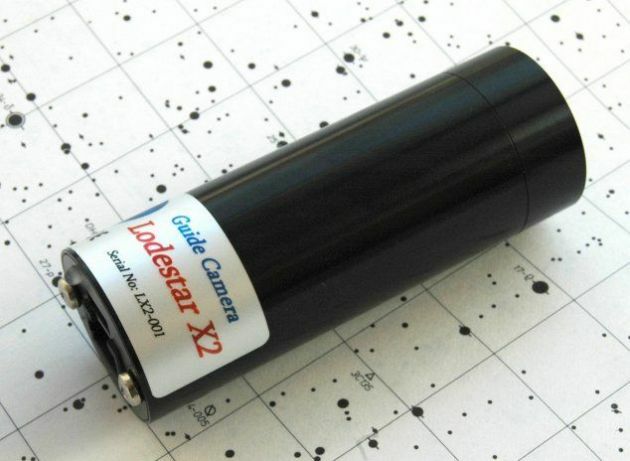 The Lodestar X2 is an upgraded version of the very popular Lodestar autoguider. The original Lodestar uses the ICX429 Exview chip from Sony and offers excellent sensitivity. However, Sony have now upgraded the ICX429 to the ICX829, with considerably improved QE and read noise. This new 'Exview 2' chip approximately doubles the Lodestar sensitivity and adds nearly a full star magnitude to the minimum guide star brightness. We have also redesigned the boards so that a standard RJ12 guide socket can be used. This will please many users who have found the small 'ZH' cable socket to be too delicate. CCD with very low dark current and vertical anti-blooming. Spectral Response: QE max at 620nM (~77%), 45% at 400nM and 770nM. Readout Noise: Less than 10 electrons RMS - typically only 6 electrons. Size: 32 x 86mm black anodised aluminium barrel with 1” x 32tpi ‘C mount’ thread at the CCD window end & input/output plugs at rear.